2016 marked the 30th anniversary of St. John Neumann Catholic School. In celebration and in the spirit of moving forward into the future a new logo was developed based on Ephesians 6:10-18, The Armor of God. 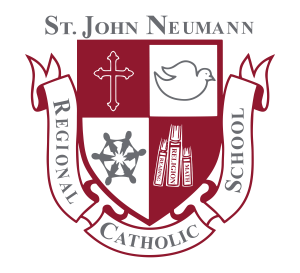 Founded January 5, 1986, St. John Neumann Regional Catholic School serves the elementary educational needs of Catholic families within the northeastern suburbs of the Metropolitan Atlanta area. SJNRCS was the first Catholic school opened in the Archdiocese of Atlanta in 25 years, fulfilling the dreams of parents in Gwinnett County and neighboring areas who desired a Catholic education for their children. Founding Principal, Sister Dawn Gear, Grey Nun of the Sacred Heart. When the school first opened in August 1986, 160 students walked through the doors at SJNRCS located in St. John Neumann Parish. In spite of its humble beginnings, the school was unique — a regional school serving families in eight surrounding parishes administered independently from the parishes it served. Sixth and seventh grades were added in 1987, followed by eighth grade in 1988, and new facilities were constructed, including a gymnasium, six new classrooms, cafeteria, library, administrative offices, and a science lab. In May 1995, the school began another facilities expansion, enlarging the Library into a full Media Center. 90% of our students are Catholic whose families are associated with 20 parishes in the Archdiocese of Atlanta. The average teaching experience of the faculty is 16 years, including teachers who specialize in art, music, media, Spanish, computer technology, media, and physical education. In 1990, SJNRCS was fully accredited by the Southern Association of Colleges and School. In May 1994, the United States Department of Education awarded St. John Neumann Regional Catholic School the National Blue Ribbon School Award for Excellence. St. John Neumann holds memberships in the National Catholic Educational Association (NCEA), the National Middle School Association (NMSA), the National Science Teachers Association (NSTA), the National Council of Teachers of Math (NCTM), the National Council of Teachers of Social Studies (NCTSS), and the Association for Supervision and Curriculum Development (ASCD). The crest of St. John Neumann Regional Catholic School was designed to represent the tradition and history of Catholic education in the Archdiocese of Atlanta. When it was founded in 1986, the school was the first elementary school started in 25 years. The colors of the crest — burgundy and gray — represent the school colors and were different than any other school in the Archdiocese. The crest was designed with four quadrants. The upper left quadrant of the crest depicts the fleur-de-lis cross of the Grey Nuns of the Sacred Heart, the order of sisters who guided the school in the first ten years. The cross also represents the Catholic faith and its presence in the faith formation and education of students. The upper right quadrant is a dove and was the original symbol of the school, chosen by the founding principal. It represents the Holy Spirit and his guidance in our lives. The lower left quadrant pictures a circle of children holding hands. When students work together in harmony, they can achieve their best. The lower right quadrant holds three books — reading, religion, and math. The trio of books reminds us that although knowledge is our goal, religion and the Catholic faith are at the center of our curriculum. The banner that surrounds the crest represents the origins of the school — founded as a regional school to serve more than one parish. While administered independently from the parishes we serve, all parishes support the school. St. John Neumann Regional Catholic School was the beginning of a new era in Catholic education for the Archdiocese of Atlanta.